I love strawberry infused water. Recipes with strawberries are among the most popular flavored water recipes on my blog, and it’s one of my personal favorites. So today I decided to create this Strawberry, Orange, and Mint Infused Water, and it’s delicious! Strawberries and oranges are not only sweet and delicious, they’re packed with nutrients, too. They contain antioxidants like Vitamin C which helps boost immunity, fight cancer, and promote eye health. Strawberries have also been known to help lower cholesterol and promote better skin health. Mint adds a nice subtle flavor to this recipe, and is also good for you, too. In a large pitcher, add the orange and strawberries. Over the pitcher squeeze and slightly twist the mint, do not tear apart you only want to gently release the oils, add the mint leaves to the fruit. Top with ice and water. Let the pitcher sit in the fridge for 1 hour before serving. When the water is down to ¼ full in the pitcher, refill with water and place back in the fridge. You can do this several times. Store Strawberry, Orange, and Mint Infused Water in the fridge up to 24 hours. Check out our Fruit Infused Water Bottle and Pitcher reviews for information on the best flavored water infusers. These portable fruit infusers are a convenient way to help you drink more infused water wherever you go. 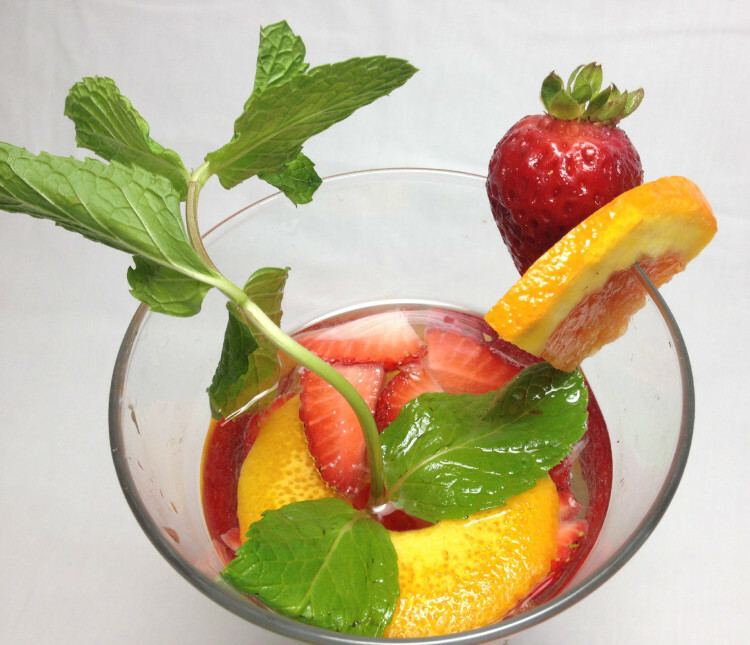 Find more Metabolism Boosting drinks like Strawberry, Mint, and Lemon Water Detox Drink, including Ice Cubes, Teas and Sodas all meant to help you drink more water and lose weight in my cookbook FRUIT INFUSION: A Collection of Day Spa Inspired, Fruit Infused Waters. This is my new favorite drink! 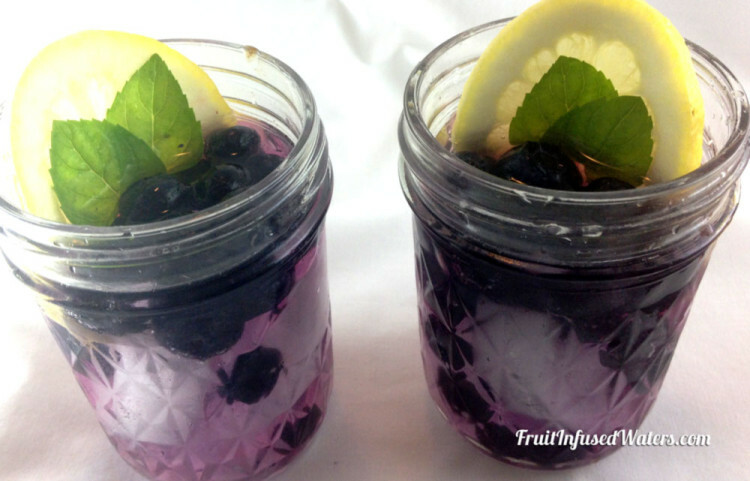 This Lemon Water with Blueberries and Mint recipe is REALLY yummy and packed full of wonderful vitamins and antioxidants. You’ll be giving your weight loss a boost with the Vitamin C since it helps regulate the hormones that cause fat storage. The blueberries are not only good for your heart, they help fight cancer and are an anti-inflammatory “super food”. The lemon is good for weight management, improved digestion, appetite control and also helps fight bloating. Mint helps boost your energy levels and helps you burn fat faster, making this a great drink for weight loss. Make this Lemon Water with Blueberries and Mint for your next gathering, or take it in a fruit infusion bottle to sip all day long for a day full of delicious, weight loss boosting, fruit infused water. For this recipe, we decided to use our new Decodyne Fruit Infusion Pitcher that our friends at Decodyne sent us to try out. This fruit infused pitcher worked great, and we really liked the stylish design and ample water capacity. The infusion chamber is the right size for the amount of water that it holds, so you get lots of great tasting fruit infused water with a pitcher that also looks great on a dinner table. I n a large pitcher, add the lemon and blueberries. Over the pitcher squeeze and slightly twist the mint, do not tear apart you only want to gently release the oils, add the mint leaves to the fruit. Top with ice and water. Let the pitcher sit in the fridge for 1 hour before serving. When the water is down to 1/4 full in the pitcher, refill with water and place back in the fridge. You can do this several times. Store this Lemon Water with Blueberries and Mint in the fridge up to 24 hours. Check out our Fruit Infused Water Bottle and Pitcher reviews for information on the best flavored water infusers. 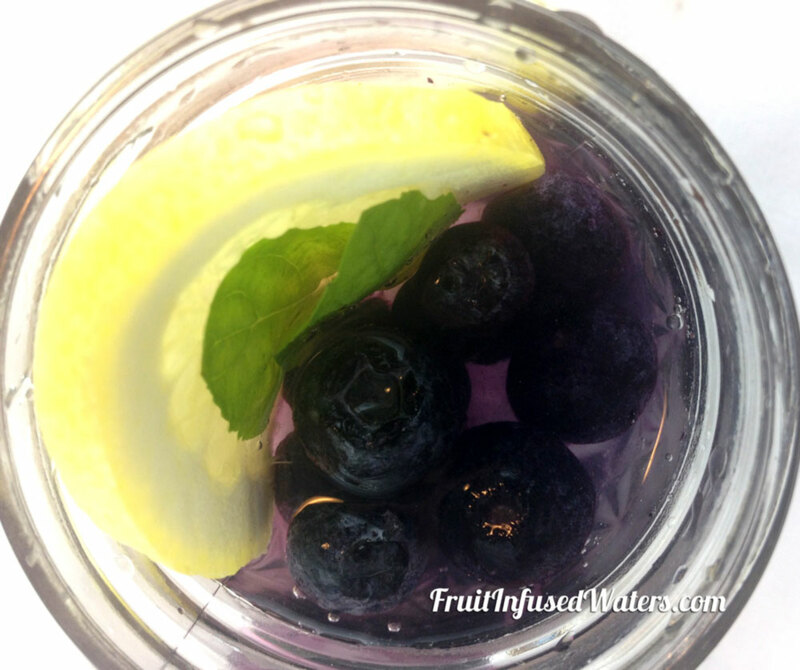 Find more Metabolism Boosting drinks like Lemon Water with Blueberries and Mint, including Ice Cubes, Teas and Sodas all meant to help you drink more water and lose weight in my cookbook FRUIT INFUSION: A Collection of Day Spa Inspired, Fruit Infused Waters.